While babies' feet generally all look similar, adults' feet change over time with constant use. Most feet have a moderate arch which spreads the weight of the body evenly over many bones and joints. Some people have feet with a lower arch (known as pes planus), which means the foot tends to be more flexible. 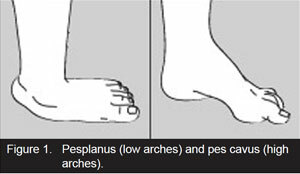 Other people have higher arches (pes cavus), which means the foot tends to be less flexible (see Figure 1). Higher or lower arches are not necessarily a problem, but may increase your chances of developing other problems such as hammer toes, bunions, or corns and calluses. The big toe joint is the site most commonly affected by osteoarthritis, but any of the joints in your feet can be affected. Many people notice changes in the arch structure of their feet as they get older, and mild arthritis in the arch area is common. Osteoarthritis is less common in the ankle, but can occur if there has been an earlier injury or as a result of long-standing inflammatory arthritis (see below). What effects can inflammatory arthritis have on my feet? The term 'inflammatory arthritis' encompasses rheumatoid arthritis (RA), reactive arthritis (Reiter's syndrome), psoriatic arthritis and ankylosing spondylitis (see 'Glossary' for more detail). The effect on the feet depends on exactly which type of arthritis you have. Rheumatoid arthritis, for instance, tends to affect many of the foot joints, while reactive arthritis usually affects only the ankle. The effects of inflammatory arthritis on each of the main parts of the foot are covered later. People with inflammatory arthritis can also have inflammation and discomfort in the tendons and the other 'soft tissue' structures in the feet. The part under the heel where the tendons attach to the heel bone is quite often affected in this way (see 'What causes problems in the ankles and heels?'). 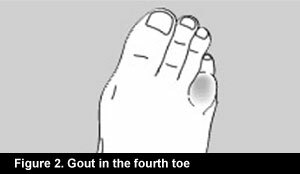 Can gout affect my feet? What causes problems in the ankles and heels? Pain in the ankles and heels can arise either from the joints themselves (where bones meet) or from the structures around the joint such as muscles and tendons. 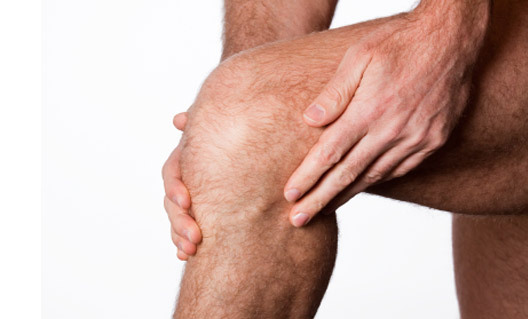 The joints can be affected by osteoarthritis or by inflammatory arthritis such as RA or reactive arthritis. Osteoarthritis is fairly uncommon in the ankle, unless there has been previous damage from an injury, or damage from long-standing inflammatory arthritis. When inflammatory arthritis affects the ankle, the joint may be especially sore or stiff when you first get out of bed in the morning, or after sitting for a while. With this type of arthritis the heel may drift outwards (see Figure 3). This so-called valgus heel is a common feature of RA. It may not cause problems if it does not drift too far, but it can be bothersome if the arch also flattens as a result. Early treatment may slow the development of a valgus heel in people with RA. Supporting shoes and/or orthoses may help. A valgus heel can also be corrected with surgery. The most common cause of discomfort around the heel is inflammation in the ligaments that attach under the heel bone. You may hear this problem called plantar fasciitis, or perhaps enthesopathy. It used to be known as 'policeman's heel' because the heel pain is eased by walking on 'tip-toes'. This is common with inflammatory arthritis, but can also occur in people without arthritis. If you can lose weight, this may help to ease symptoms in the heel. Treatment with a local steroid injection, and changes to footwear or insoles, may also help. The arches of the feet form a mechanism similar to the arch of a bridge, allowing the weight of the body to be spread over many bones and joints. The arch structure can change with arthritis, and the structures nearby can be strained. In mild cases this feels like tiredness in the arch area, but pain and discomfort may develop if the muscles or tendons are very overworked. Losing some weight can help a lot, although this can be difficult to do if your feet hurt, because exercise becomes more difficult. Swimming is a good alternative form of exercise which you may be able to do instead of walking or other 'weight-bearing' exercises. If you have pain in the arches then non-steroidal anti-inflammatory drugs (NSAIDs), taken as tablets, or a local steroid injection may help. Some people also find arch supports or orthoses (functional orthoses) helpful for arch pain or tiredness. Bunions are bony lumps that develop on the side of the foot at the base of the big toe. The big toe joint becomes stiff, and its range of movement is reduced. A fluid-filled sac under the skin (a bursa) may develop here too, especially if shoes press against the bunion. The bursa may become inflamed and painful. Sometimes, as the bunion develops, the big toe may be pushed over towards the smaller toes (this condition is known as hallux valgus). This can cause the other toes to become clawed, a condition known as hammer toes (see below). In RA a bunion combined with clawing of the toes is common (see Figure 5). If a bunion forms, the symptoms can be controlled. Choosing shoes with a soft upper will reduce pressure and rubbing on the bunion joint. If the bunion or the bursa does flare up then 'bunion pads' can be bought from the chemist. However, these should only be used on the advice of a podiatrist/chiropodist. 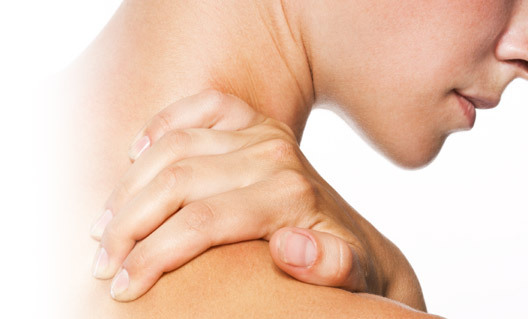 If the joint is continually painful over a long period of time, surgery may be needed. Hammer toes (also known as claw toes, mallet toes or retracted toes) occur when the toes are permanently bent (see Figure 5). Hammer toes happen either because of problems with the tendons inside the foot, or because the toes are squashed by poorly fitting shoes and/or socks. Hammer toes are most common in feet with bunions, and in high-arched feet (pes cavus). The most common cause of discomfort from hammer toes is a build-up of hard skin over the raised-up joints. There is a risk of developing ulceration but this is uncommon. The only way to correct hammer toes is with surgery, although splints made of rubber, leather or silicone may help control mild cases. Any pain from corns and calluses may be eased by choosing shoes of a more generous fit, or with uppers made from soft materials. A protective pad over the area may also reduce the symptoms. What causes pain under the ball of the foot? Pain can be caused by arthritis actually in the joints of the ball of the foot, especially if you already have arthritis elsewhere in your body. However most pain under the ball of the foot comes from minor damage to the soft tissues – the tendons, bursae, fat pads, nerves and skin. Bursae are often found under the ball of the foot in people with RA (see Figure 6). They also occur next to large bunions. The amount of fluid within the bursae can change and they grow and shrink as the amount of inflammation in the area varies. Treatment for the inflamed bursa starts with reducing pressure on the area. One type of nerve problem arising in the forefoot is called a neuroma. This is a thickening of the nerve, caused by rubbing against other internal tissues. This is most common at the base of the toes. The symptoms of a neuroma are pain or tingling in the toes. However, most neuromas cause little trouble and should settle once more roomy footwear is found. It has been suggested that special insoles and pads under the area can help, and these may be available through a podiatrist/chiropodist. Sometimes a local steroid injection is recommended. If symptoms become severe, surgical removal of the thickened nerve may be needed. In people with RA, rheumatoid nodules (firm, pea-sized lumps) can occur at sites of pressure such as the big toe joints, the back of the heels, or on the toes. Nodules occurring on the soles of the feet can be particularly uncomfortable. Padding can ease discomfort by cushioning the lumps. In some cases, surgical removal of the nodules may be needed. The most common cause of discomfort under the ball of the foot is a build-up of hard skin (called callus) and/or corns. Callus forms at areas of high pressure or friction. If pressures are extremely high, small areas of skin within the callused area produce an abnormal type of skin tissue leading to the formation of a corn. Discomfort from corns or calluses can be relieved by scraping away the excess skin with a pumice stone or an abrasive board (but never with an open blade). You should not do this yourself without advice from a registered podiatrist/chiropodist – if the tissue is weak in that area you may do more harm than good. Bear in mind also that the callus will grow back in 4–6 weeks unless the pressure or friction which caused it is removed by changing to softer or roomier footwear, or pads added inside the shoes. If you are overweight, losing some weight can help ease the pressure on painful feet. Exercise is important in keeping joints moving, and the rest of the body healthy, but it may be necessary to change the type of exercise you take if your feet hurt. For example, swimming might be an alternative. Many people can look after their own feet without help. If your ankles feel stiff in the morning, allowing some time for the joints to 'loosen up' will usually help. During the day, alternating sitting and standing activities helps to take the pressure off the feet. You can do a lot to help keep your feet in good shape. If you are fairly healthy and your skin is in good condition then you may be able to manage your feet quite well without any help. For some people with arthritis, the disease itself, the medications they take or other (sometimes unrelated) problems mean that they may need to be more careful. If you are worried about the state of your skin, please ask your doctor or a registered podiatrist/chiropodist for a check-up. A basic foot-care kit you can use yourself. Wash your feet every day in warm soapy water and dry them thoroughly, especially between the toes. A cotton wool bud gently inserted between toes may help with this. If the skin between the toes gets white and soggy-looking, applying surgical spirit with a cotton wool bud will help. Never apply surgical spirit if the skin is cracked or sore – wait a few days for the cracks to close. Check your feet every day for any problems. You can use a mirror if you have trouble getting down to see. Minor cuts, abrasions or blisters should be covered with a clean dressing and kept dry. If they do not heal within 2–3 days then seek professional treatment. If your skin is dry, you can apply moisturising cream. Don't apply cream between your toes, though, as it tends to make the skin there soggy. If you have difficulty bending down, use the top of one foot to massage cream into the sole of the other. Nails should be trimmed every 6–8 weeks. Cutting the nails straight across and using an emery board to file down the sharp edges reduces the chance of 'ingrowing toenails'. You may find it easier to cut your nails after you have a bath when the nails are softer. Long-handled nail clippers are often easier to use than scissors. People on some medications (such as steroids), and people who heal slowly or have had problems with ulcers or vasculitis in the past, should seek professional advice first. If you have corns and calluses, you may be able to use an emery board or pumice stone to keep them under control. You should never use an open blade such as a scalpel or razor blade. Special skin files and scrapers may be suitable as long as you and your skin are in good health. Check with your doctor or a registered podiatrist/chiropodist first, especially if you have vasculitis or any history of skin ulcers. Over-the-counter creams and medicated corn plasters are not recommended generally, and people with vasculitis or people who heal slowly should avoid these treatments altogether. Socks or stockings should be changed every day, and it is not good to wear the same shoes for more than 2 days in a row. Damp shoes are ideal conditions for growing bacteria and fungi. It takes a day or so for the shoes to completely dry out after they were last worn. Athlete's foot is an infection of the skin caused by a fungus. It is quite common in people with hammer toes because the warm, damp area between the toes is an ideal environment for the fungus to grow. Athlete's foot causes itching, and sometimes a speckled red rash on the skin. The athlete's foot may disappear on its own if you are very thorough with washing and drying your feet, but a cream or powder from the chemist will speed things along. Many herbal and complementary preparations and devices are available and some people find these helpful. However, the effectiveness of treatments such as acupressure sandals and magnetic insoles is not supported by medical evidence. Therapeutic massage can be helpful in reducing pain or tiredness in the feet. Massage can be combined with a relaxing warm-water footbath, and either of these is fine as long as you don't have any open wounds or sores on your feet. What if I cannot manage my feet myself? There are a number of people who may be able to help you. Your GP or hospital consultant can refer you for professional care. For many foot problems your first contact should be with a registered podiatrist/chiropodist. She will help with troublesome nails, corns and calluses, and will also be able to provide advice and help with obtaining special shoes or orthoses. Most podiatry services accept patients on a self-referral basis without seeing a GP first. Other professionals who can be of help include physiotherapists and occupational therapists, who may have treatments or exercises to ease symptoms and keep you moving. 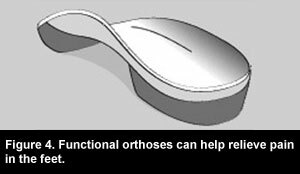 Orthotists can also help in giving advice and are specialists in providing better-fitting shoes and insoles. If you need surgery to improve the structure of your feet, you would normally be referred to an orthopaedic surgeon. Some registered podiatrists/chiropodists are also able to perform minor surgery. All of these services can be coordinated by your GP or rheumatology specialist. Joint replacements for the ankle and foot are not yet as successful as replacement for knees and hips. Most foot surgery is aimed at correcting the positions of the joints by resetting the bones or fusing the joint in the corrected position. If you are considering surgery, do discuss all of the available options with the surgeon before deciding whether to go ahead. If just one or two joints are inflamed and painful, a steroid injection may be recommended and given by the doctor, usually under a local anaesthetic. You will have to rest for up to 48 hours after the injection. A steroid injection may also be useful for inflamed tendons (tendinitis), neuromas and inflamed bursae. Comfort is the best pointer to the suitability of a shoe for you. If the footwear protects your feet against injuries and keeps them warm, dry and comfortable, then it is doing its job. Soft, flexible and ideally waterproof. Leather and many modern synthetic materials are quite acceptable, though leather tends to be more breathable. Discuss this with the retailer. A smooth lining without seams reduces irritation of hammer toes and prominent joints. Should be deep enough to allow you to wriggle your toes and be a similar shape to the natural shape of your feet. Strong and flexible for good grip. A cushioned sole may be more comfortable (trainers are sometimes ideal). A removable insole can be taken out to be cleaned, and is easily replaced when worn out. Takes much of the body weight. Provide a stable fit and some flexibility to allow for unusually shaped feet or swelling. Fastenings include laces, buckles, Velcro and zips. Slip-on shoes may fall off at the heel or are often bought a little too small to keep them on, cramping the toes. What do I need to think about when I am buying shoes? Have your feet measured if they have become wider over the years, or have changed shape because of arthritis. Your feet may change shape when you stand up, so have them measured while standing. Try shopping for shoes later in the afternoon. If your feet tend to swell, this will be when they are at their largest. Size varies between shoe brands and style. Judge a shoe by how it feels on your foot and not just by the size marked on the shoe. Think about how the shoe fits around your toes, under the soles, and at the back of the heels. Many people have one foot bigger than the other. Always buy your shoes to fit the larger foot (an insole can be used in the other shoe). There should be at least 1 cm (3/8 inch) of room at the front of the longest toe. Try shoes on with the type of socks or stockings you normally wear, or with any insoles or orthoses you normally wear with them. Some insoles may need extra depth, especially in the toe area. The right shoes for you will be comfortable when you first try them on. Buying shoes to 'break in' later is not a good idea. Soles should be light, hard-wearing and flexible. The sole should be able to bend along an imaginary line drawn from the base of the big toe to the base of the little toe. Leather uppers are usually the most comfortable if you have foot problems. If you can, try to get shoes which also have leather inners (the inner lining). These are more breathable than inners made of synthetic materials and will help avoid dampness and fungal infections. If you are worried about the appearance of your feet, shoes in dark colours and a suede finish will help to disguise the problem. What can I do if I find it difficult to deal with fastenings on my shoes? Lace-up shoes can be difficult to fasten if you have arthritis in your hands. Elastic laces can be easier to use because one pull ensures a snug fit. They do not need to be tied again. Many shoes are now available with Velcro fastenings, which can be fastened and adjusted using only one hand. A zip fastening can be easier to manage than laces or buckles, and a ring (such as a key-ring) added onto the zip pull can make it easier to pull up. There are also a number of devices currently available to help people with putting on socks, tights/stockings and shoes. Is it all right to wear slippers around the house? Many people prefer to wear slippers in the house rather than shoes. However, slippers are not a good idea for those who have to wear special insoles. Slippers also sometimes cause falls in the elderly. The uppers of slippers are often soft and so are comfortable for hammer toes and prominent joints, but the soles can lack adequate cushioning. Like outdoor shoes, slippers should fit properly and should not be too loose. Backless slippers and slippers with a high heel really should be avoided. The features of the ideal slipper are generally the same as for the ideal shoe. My feet are always cold: what can I do? Many slippers, shoes and boots are available with linings such as sheepskin or synthetic fur to help keep the feet warm. Wearing thicker socks or two pairs (as long as they are not too tight) not only helps to keep the feet warm but also provides extra cushioning under the soles of the feet. Keeping the feet warm will also be easier if you keep the rest of your body warm.